Wales should keep Shaun Edwards for the 2023 World Cup cycle says fellow Grand Slam-winning defence coach Clive Griffiths. Edwards is in talks with the Welsh Rugby Union to stay on in the backroom staff after the 2019 World Cup. The 52-year-old is being lined up to work alongside Byron Hayward under new head coach Wayne Pivac. "You have the best defence coach in your organisation, why would you not want to keep him?" said Griffiths. It was announced earlier this week Edwards would not be taking up the post as Wigan Warriors head coach for the 2020 season. After Pivac was announced as the Wales coach to replace Warren Gatland, he says he spoke to Edwards initially about staying on but thought the defence coach was committed to Wigan. Now he is available, Edwards is in talks about being part of the new coaching team and Griffiths believes he should be handed a four-year deal until the World Cup in France. 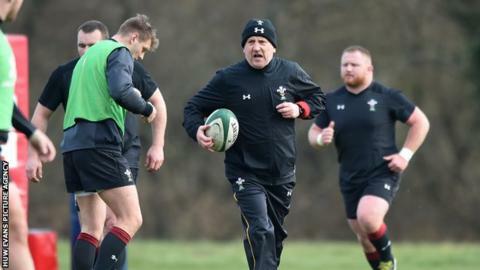 "If I was anything to do with Wales I would be on the phone and making sure he would stay for the duration," said Griffiths, who was Wales defence coach under Mike Ruddock for the 2005 grand Slam. "If you don't want him for the duration then say it. You can't say it just for a year or so, the man does not deserve that. He deserves to be treated with respect for the job he has done. "It would be a massive boost for Wales if he stays. Anybody who watched Wales this year and in the past realises he is doing a great job. "You just have to listen to the players in their interviews to understand how much they respect Shaun." Griffiths, however, remains unsure how a new-look defensive structure of Edwards and Hayward working together would function. "Knowing Shaun he is driven and has his own way of doing things and you will want to try to avoid any clashes along the way," said Griffiths. "Byron is an accomplished coach but he does not have the track record at international level that Shaun has. "If they are looking at an apprentice and guru situation then that is one way to approach things. "But for me you entrust somebody to do a job, Shaun would be the head of the defence department and he would run things without interference. "You have other coaches who are designated to attack and set-piece, so why would you need it to be different in the defensive department?" Griffiths, who is back as director of rugby at Doncaster Knights after falling ill in September 2018, defended Edwards' decision not to link up with his former club Wigan after a verbal agreement between the two parties. "There was no contract signed," said Griffiths. "When you talk about verbal agreements and speculation but until the ink is dried there is no binding contract."